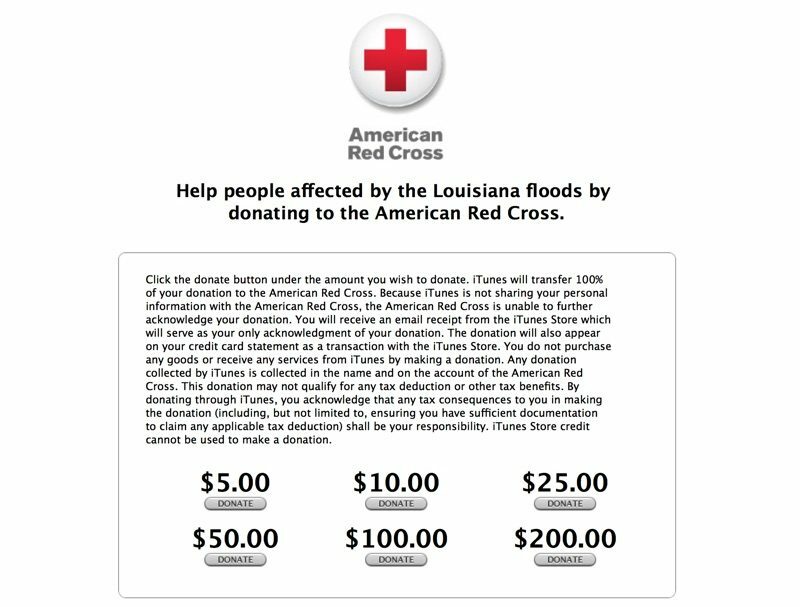 Apple has added banners to its U.S. website, iTunes Store, and App Store encouraging customers to donate to the American Red Cross to help support people who have been affected by the widespread flooding in southern Louisiana. Donation tiers available include $5, $10, $25, $50, $100 and $200, with all proceeds from donations sent to the American Red Cross. All transactions are processed as iTunes or App Store purchases. Flooding in Louisiana, which started last week after torrential rainfall, have damaged more than 40,000 houses and left many thousands of people without homes. More than 20 parishes have been affected, and in many of the areas, flood insurance was not common because they weren't known flood zones. The Red Cross has called the Louisiana flooding the worst natural disaster in the United States since Hurricane Sandy. Apple often puts out a call for donations for disaster relief. In the past, Apple has collected Red Cross iTunes donations for the 2016 fires in Alberta, the 2015 Nepal earthquake, the refugee and migration crisis in the Mediterranean sea, the 2013 Philippines typhoon, and more. Why does Apple always want to be the middleman in things? Why can't people just donate directly to red Cross? Does Apple take 30%? If you go Apple's web site, you will see this (screenshot) at the bottom where you can click to donate. It seems pretty obvious Apple is trying to get the word out on this to help raise money. Do you seriously think Apple is taking a 30% fee for this or are you just trolling? Just keep in mind before donating, the American Red Cross has a terrible track record of actually providing help. Good article about what they have accomplished in Haiti, worth the read. ('http://www.npr.org/2015/06/03/411524156/in-search-of-the-red-cross-500-million-in-haiti-relief') Search out a smaller charity that has some initiative beyond their executives salaries. Sigh, another ad for the Red Cross, one of the most useless relief organizations. Is this something Apple does reflexively? Can't they choose some other aid organization? How are they useless? I had a friend whose house burned down and she and her family barely made it out alive. The Red Cross was there for them and got them taken care of the first few days before their insurance and all of us friends could get on the ball and get clothes and stuff to them. MR forum members turn disaster relief into a reason to complain in 3..2..oh, wait, already happened. They really just don't care. Remember in the old days when the page hero image was replaced with the donation request? This is just a button hidden below the scroll line. The marketing department is just trying to score some points. I bet if this was an India tragedy of some sort it would be the whole page....just saying. Apple if you care at all...how about some matching donations to help customers in need. Apple caring about others is not incumbent on whether or not said company acts in a manner you agree with. It is amazing how many here are taking the time to bash Apple for doing something good. This thread isn't about whether or not Apple employees are focusing more of their efforts on product development etc. This thread isn't about whether or not Apple gives an amount of money to charity to those in need, that the select few here at Macrumors see fit to overanalyze and disparage, because Apple is a large corporation. This thread is about making people aware of the need in Louisiana. If you would like to give to those in need via the manner posted, please do. If not, there are other ways that you can help, instead of nitpicking and bashing Apple. Or they just want to make it simpler for people to do it and get the weird out to more people? But that would probably be too straightforward and realistic of a take on it that isn't as exciting and exhilarating as some sort of a more "malicious" type take on it. Are you serious? With Apple's presence and immense customer base they have the power to motivate people to donate that otherwise might not. Amazing you think that Apple is taking 30% off the top. No worries, you don't have to donate or lift a finger to help, but carry on and feel free to slag on Apple for stepping up. It WOULD be nice if Apple donate Red Cross and help the poor people. It WOULD be nice for you to do a bit of research before quickly assuming they don't.